Hand forged tools and more from the hills of Kentucky. Brad Holman, the blacksmith for Rocky Woodland Forge, has worked with metal for over 20 years (machinist, welder, mechanic, paintless dent repair). With his passion for the outdoors and his talent in metalworking, Brad began forging the tools needed for his wilderness adventures. Others soon wanted these hand-crafted pieces for themselves and the business began. Julie Holman, the web developer and merchandiser for Rocky Woodland Forge, is a full time software developer. ​Check out the website and Facebook page for dates on public demonstrations. In 1887 Bishop Dudley purchased an acre of land, and in 1884 it was mortgaged to the American Church Building Fund to build a new stone church. The cornerstone was laid in 1896; local carpenter and stonemason, Richard Nathaniel Lyons, Sr., completed the new church. On November 15, 1903, the Bishop consecrated it as St. Thomas, Beattyville. St. Thomas continues today to serve the people of Beattyville and Lee County with worship and community activities. 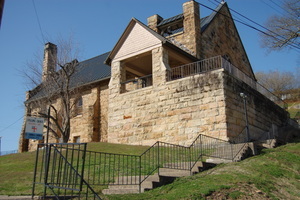 Its membership contains several descendants the early St. Thomas Church. The Kentucky Heritage Commission recommended St. Thomas's nomination to the National Register of Historic Places under the auspices of the National Park Service, U.S. Department of Interior, on June 30, 1974. Governor Ford designated it a Kentucky Historical Landmark. Located on East Main Street in Beattyville. It is a neat museum tucked away in the Beattyville. 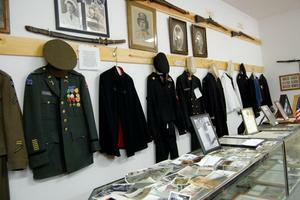 Recently added Veteran Hall is probably the most impressive section of the museum. There is a nice combination of graphics, like wartime posters and pictures and tangible objects, like sabres, badges and even uniforms. Each uniform has a name and was donated by that solders family– it really brings home the reality of war. The ancient Native American cultures are well presented along with the pioneering history of logging, railroad heritage, county’s agriculture and oil boom days. There is evidence of the local prison craftsmanship in the museum’s interior feature. Well worth a stop and conversation with the local folks. Great place to visit to get a visual impression of the history of the region. Follow the BLOG! Open Tuesday- Friday 9:00am to 2:00pm. Call on weekend to have it open. Located off HWY 11 South in Beattyville. A wall of bricks engraved with a veteran's name and service record off HWY 11 in Beattyville, KY. The wall was designed to reflect the military service of any and all veterans form Lee County who served their county, in any capacity. All families are welcome to purchase a brick for the wall and often grandchildren do crayon rubbings of their relatives names. Names on the wall include Lt. James McGuire, who was killed in the battle of Blue Licks in the last battle of the American Revolution. Also recent soldiers such as Sgt. William G. Bowling who was killed in Iraq. 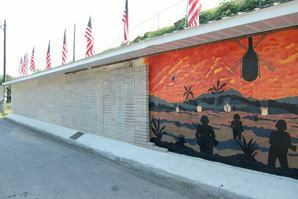 By its very design, the Memorial Wall will not be finished as long as soldiers are called for duty. The hope is that this mural will never be covered. Built at the peak of the Iron industry era, the Fitchburg Furnace was completed in 1868. At the time, it used to be largest charcoal furnace in the world and for several years, Fitchburg was truly a thriving city. The structure of the furnace and its perfect standing shape makes it a “Must See” sites for historians, architects and people just interested in history. 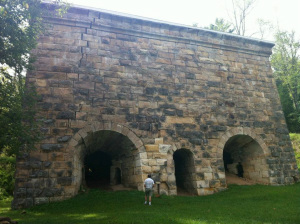 The furnace is structured on a single stone and has twin stacks, which measure 60 feet high and 116 feet long. Built with a total investment of $160, 000 the furnace stopped operating in 1873. It is currently operated by the U.S Parks Service mainly as a Historic sites.